If you’ve tried to learn every little thing about the Last of Us, then chances are you’ve already seen Faith Erin Hicks’ artwork. 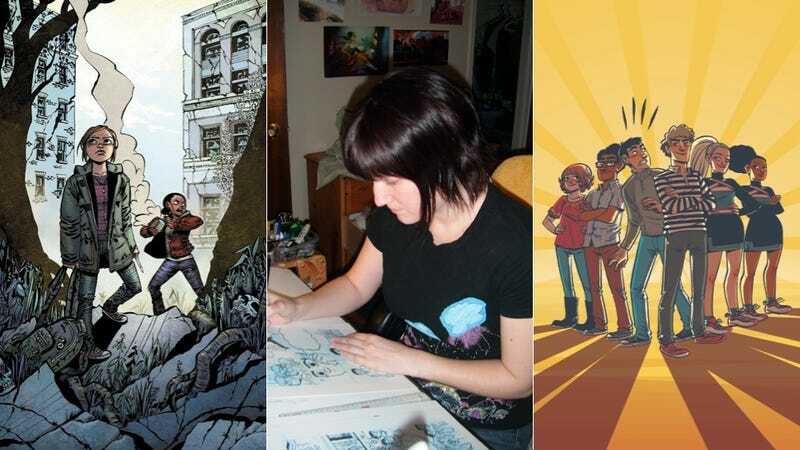 She’s been drawing The Last of Us: American Dreams prequel miniseries published by Dark Horse Comics, which focuses on the character of Ellie before she meets up with playable protagonist Joel. But Ellie isn’t the only teenager Hicks has sketched out in recent months. She’s also collaborated with Prudence Shen on Nothing Can Possibly Go Wrong, a new graphic novel from First Second. When a high school budget can only afford to give money to one group, a robotics club and the cheerleading squad go to war over who’ll get the funds for new equipment or outfits. Best friends Charlie and Nate find themselves on either side of the tension but a so-crazy-it-might-work scheme brings both factions together for a crazy road trip. NCPGW serves up familiar jock-vs-nerd conflict but adds a layer of emotion to the characters’ personal lives that will win you over. I talked to Hicks about drawing a post-apocalyptic world, revising high school and her dalliance with Resident Evil series’ hunkiest protagionist. No, it’s not Hunk. Kotaku: Both of your currently publishing series focus on young people in radically different situations. Ellie' s living in a broken world after a horrible plague and the characters of NCPGW are facing a crumbling social order, but one that's a lot more light-hearted. Did you get whiplash moving from one to another? Oh boy, did I ever. It was actually even worse than you describe; if I'd gone from Nothing Can Possibly Go Wrong straight into drawing The Last of Us: American Dreams, it might've been a little easier, because at least NCPGW is a book for teens and has realistic backgrounds and stuff like that. But there was a third comic that I was drawing in 2012 (because apparently I have to draw ALL the comics, god help me), a kids' comic called Bigfoot Boy, which was written by J.Torres. So I went from drawing Nothing Can Possibly Go Wrong (realistic teenagers, robots, set in a modern town) to drawing Bigfoot Boy (about a 10 year old boy who finds a totem in a forest that turns him into a Sasquatch; very cute, bouncy kids-comic-artwork) to drawing The Last of Us: American Dreams, which is grim and gritty and has lots of guns. It was a little bit nuts, trying to switch art styles and give each comic the look I wanted it to have. Kotaku: You and Prudence Shen are dealing with a lot of well-trod dynamics in NCPGW: jocks & cheerleaders vs. tech nerds, children of divorce and clueless administrators. What was the key for making this work feel like something readers hadn't seen a thousands times before? On its surface, Nothing Can Possibly Go Wrong uses some familiar tropes, jocks vs. nerds, popular kids vs. those low on the social totem pole. But what really drew me to the story was how Prudence took those tropes and turned them on their ear. Nate, one of the two main characters, is a nerd, but he's also aggressive and goes out and gets what he wants. He doesn't care about being popular, he just wants what he thinks he deserves. In contrast, Charlie is a well-liked basketball playing jock, but he's also completely at Nate's mercy and unable to stand up for himself, despite the fact that he's "popular" and "normal" (whatever that word means) on the surface. Prudence and I are both pretty geeky, and I liked that we were able to take a hard look at geek culture and the tropes that revolve around geekdom and play around with them. Kotaku: Even though the game's not out yet, people are already praising the spare loneliness and quiet desperation of The Last of Us' art direction. How did you try to capture that in your own work for American Dreams, despite not having a photorealistic art style? Mostly it's silence, timing and character development. I get a lot of comments on the use of silence in my comics. I really like scenes where the emotions are played out through the acting of the characters I'm drawing, and I wanted to bring that to The Last of Us comic. I'd seen previews for The Last of Us game before I started drawing the comic prequel, and noticed it seemed a little different than a typical post-pandemic game; it focused on character and on the ruined world around the characters, which I thought was an unusual way to sell a Naughty Dog game. When I started working on The Last of Us comic with Neil Druckman, I really wanted to play around with timing and silence in the comic, have moments where Ellie was overwhelmed and almost quashed by the environment she's forced to liv e in. And then, she ... spoilers, can't say! Read the comic to find out. Kotaku: Was there any part of telling Ellie's story in American Dreams that you were excited to tackle? Argh, I don't know how much I can reveal! I was very excited to draw ... um, certain upcoming villains. Oh man, they were so fun. Can't say more than that! Kotaku: As far as you're able to speak to it, what are the big differences between animation production work for TV and for video games? So far in my comics career I've done a lot of work on my own comics, which has been incredibly amazing. With animation, I was always working on someone else's project, always contributing a tiny part of a larger work, rather than doing it all myself. There are things I miss about working in animation (the people, mostly), but I like creating my own stories, and I like being able to do everything myself, which I'm able to do in comics. From start to finish, I can make a comic all by my lonesome, but to do an animation ... that's much more complicated! Kotaku: Is there another video game character or series you'd love to get your hands on? Hicks: I'm a big fan of Resident Evil 4, I'd love to do some non-silly comics about that game. I did some RE4 fan comics previously, but they are incredibly silly and mostly about how Ashley has the hots for Leon. Maybe someday I will do serious Resident Evil 4 comics, just for fun! Any excuse to draw Leon Kennedy, really.